Newly Renovated Detached Period Cottage - Walking Distance to Melrose! Heron Cottage is a delightful detached cottage dating back to the early 1800’s, situated in the attractive village of Newstead providing the perfect Scottish Borders self catering accommodation. The historic town of Melrose is just a short 15 minute walk away where there are a wide variety of amenities and attractions, including a varied range of specialist shops as well as quality restaurants, bars, and sporting activities, including the famous Melrose Rugby Sevens. Heron Cottage is an beautiful detached period cottage that has recently undergone a complete renovation inside to offer stylish, contemporary self catering accommodation. Although the exterior of the cottage is traditional in appearance, it is in complete contrast to the modern accommodation that lies within. Immaculately presented throughout, Heron Cottage oozes good taste and boasts a beautiful sleek high gloss kitchen and the luxurious contemporary bathroom even has ‘his and hers’ wash basins! A fabulous wood burning stove in the lounge ensures a warm welcome awaits guests whatever the season. The lounge is fully equipped with a widescreen LCD TV with Freeview, DVD player and hi-fi quality iPod speakers. Due to its history and age the property is naturally quirky which adds to its charm with some limited height space on the first floor. Heron Cottage is situated in the heart of Scottish Border country, an ideal base to explore the many nearby abbeys, castles and stately homes including the historic Melrose Abbey. Most countryside pursuits are available here or close by, including walking, cycling, mountain biking, fishing, golf, pony trekking, tennis, canoeing, shooting, exploring and much more. If you want to visit Scotland’s capital city, Edinburgh is less than an hours drive away. There is also a newly opened train line that links the Borders to Edinburgh city centre. Tweedbank station is a very short drive from Heron Cottage and has ample free parking. The train takes you right into the heart of the city in around 40 minutes - a brilliant day out! The banks of the River Tweed are just a few minutes walk from the Cottage. Grab a picnic and head down to this tranquil setting - watch the wildlife and spot fish jumping in the river. Whether you are looking for a peaceful, relaxing break or a more energetic outdoors holiday, Heron Cottage is located at the centre of the idyllic rural setting of the Scottish Borders that has got everything covered. We are Keith, Nicole, Freya & Robby Scott. Heron Cottage is our holiday home in the gorgeous Scottish Borders. We bought the cottage as it is close to Keith's family and when we're not visiting the Borders, we rent out the cottage - we are very proud to have received visitors from all over the World! We love walking into the village of Melrose to eat at the many brilliant pubs and restaurants, followed by a stroll around the lovely gift shops. Just a few minutes walk from the cottage is the famous River Tweed where Freya and Robby spend hours combing for treasure along the shore - in warmer weather we often take a picnic down to the river. For us, staying at Heron Cottage is a brilliant way to escape our busy lives in Manchester. We regard Heron Cottage as our home because we enjoy staying here too.....we think we have thought of everything needed to make it a true home. We decorate and upgrade on a very regular basis to keep the Cottage looking clean, tasteful and welcoming - we appreciate guests choosing to spend their holiday at Heron Cottage and want them to be completely happy and relaxed throughout their stay. We fell in love with Heron Cottage at first sight! A quaint, cosy cottage that was once upon a time the local village store with just 2 rooms! It has been extended over the years and we think it makes the perfect holiday cottage - full of character and steeped in history. Gorgeous, just renovated contemporary family bathroom located downstairs, with round twin sinks, bath with large overhead rainfall shower head. Also separate hand held shower head for showering hair, babies etc. Heated towel rail and two large shelves providing plenty of storage for your toiletries. Hand soap and moisturiser always available. Spacious lounge featuring a 32" LCD TV with Freeview, DVD player, hi-fi quality iPod speakers and a traditional wood burning stove, with a basket of logs provided. A selection of DVDs, games, books and magazines are available for your enjoyment. Tea, coffee, sugar, salt & pepper provided. Large modern kitchen/dining area contains electric oven, induction hob, fridge/freezer, integrated washing machine and tumble dryer, dishwasher, toaster, microwave and dedicated wine fridge! Dining area features a dining table seating 4. Speaker available with connecting cable for smart phones. Small seating area - also there is a communal green across the road from Heron Cottage. It is very peaceful with benches - perfect for enjoying a cup of tea and watching the local rabbits! There are 20 golf courses within 20 minutes drive of Heron Cottage, with championship-standard venues, and impressive hidden gems. The Roxburghe in Kelso is a favourite of former Ryder Cup captain Sam Torrance and the course at the Macdonald Cardrona Hotel, Golf & Spa near Peebles, offers a great test in a unique setting. For a shorter challenge, the tranquil 9-hole parkland course at St Boswells sits on the south bank of the River Tweed and the picturesque course at Melrose lies at the foot of the Eildon Hills, both are just 10 minutes from the cottage. Heron Cottage has 2 upstairs bedrooms, and downstairs is a modern and spacious kitchen/dining room, bathroom and contemporary lounge. The windows to the front of the cottage have been kitted out with made to measure plantation shutters for added privacy. The kitchen has a sleek and modern look and is fully equipped, including a washer/dryer and dedicated wine fridge! The dining area features a dining table that seats 4 people. The lounge is the perfect place to relax, including a 32" LCD TV with Freeview, DVD player, hi-fi quality iPod speakers and a traditional wood burning stove, with a basket of logs provided. A selection of DVDs, books and magazines are available for your enjoyment. Luxury modern bathroom features twin sinks, a large heated towel rail, and bath with rainfall shower. Bath towels and bath robes are provided. A range of books, leaflets, local tourist information and maps are also available so you can make the very most of your stay. Outside: The cottage is located on Main Street in Newstead, directly opposite the lovely village green complete with old red phone box! Parking available in the street right outside the cottage. There is a small secluded seating area in the front garden which gets the sun in the evening, so you can watch life go by in the oldest inhabited village in Scotland. Cleaning / Towels / Linen / Maid service: Towels, bed linen & robes included. 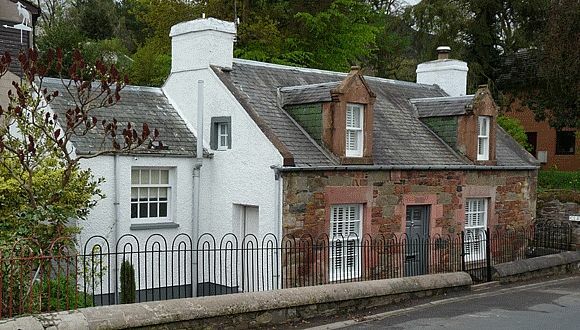 Beautifully renovated cottage in the Scottish Borders. Lovely cottage. Warm, cosy, immaculate. Loved the bathroom. Car parking in the street just outside. The cottage is a 20 minute walk from Melrose and we walked into town along the Tweed riverbank and then back along the road. Interesting walks nearby. Only downsides - the ceiling height in the bedrooms is low and you really need a car as there are no shops or pubs in Newstead. For a quiet break in the Scottish Borders, this cottage is really good value for money. We would definitely go back. Lovely wee cottage nicely decorated. Very good facilities. Good location for Melrose and Kelso. 3rd visit to Heron Cottage. Had a very relaxing and comfortable stay. The cottage has everything you need and is exceptionally clean. If you want to have meals in there are good cooking facilities. Pre visit contact with the owners was very good with clear instructions of key collection etc. The cottage is well situated for exploring the Borders. Borders railway 5-10mins drive away is an easy way to get in to Edinburgh. From the moment we booked the property to the day we arrived the communication was superb - we've rented many properties and the pre arrival information was by far the best we've ever had. The property is decorated and maintained to a high standard throughout and was very comfortable for our stay. The rooms are generous in size, although the headroom in the bedrooms could be a problem if guests are very tall (we're all around 5ft 10in and we all managed fine). The beds are comfortable and the newly decorated bathroom is spacious. It's a 10 minute walk into Melrose, which is a lovely little town, and convenient for many of the towns and villages around the Borders, including Tweedbank for the train to Edinburgh. Overall, a fantastic stay and we'll be back very soon. We loved staying at this cottage! From the nicely appointed interior to the charming old world exterior, it was perfect! We were able to enjoy a walk to Melrose along the River Tweed, as well as explore the many paths around the cottage. One of the bedrooms was quite tight, especially for a tall person and two pieces of luggage and no furniture to hold clothing. Also, though very nice, the location of the only bathroom on the first floor with the bedrooms on the second can present some difficulty. We would definitely recommend this one! A beautifully appointed cottage that is very well equipped with everything you would need staying self-catering - we stayed as a couple, but it would not have been overcrowded if one of our couple friends had joined us. Despite the snow and chilly mornings the owners ensured the heating was on. For the evenings we cosied up to the log burner. You just have to be mindful of some low ceilings in the bedrooms - but it's all in keeping with the quirky style. 45-minute drive (35 miles) to the picturesque east coast beaches at Coldingham Bay (Blue Flag Beach) and Berwick-upon-Tweed. Coldingham Bay is a fantastic, secluded beach, renowned for surfing and body-boarding with loads of rock pools to explore.